Went to hell in a wicker basket , didn't it ??? In the second pic ( http://imageshack.com/...g922/5633/Dj7pnj.jpg ) , it looks like a lot of the center area is fairly well converged !! Are you able to move ALL 3 colors up & down & left & right ??? When you are done leave the center cross converged..
"Went to hell in a wicker basket , didn't it ??? " It's starting to get to the point where all this is becoming personal between me and this effin' TV. NOW........what I'm hoping to do...... is get this pig working PERFECT...then I was thinking about wheeling this sucker outside, busting out the shotgun and blowing it to smithereens.....LOL j/k. 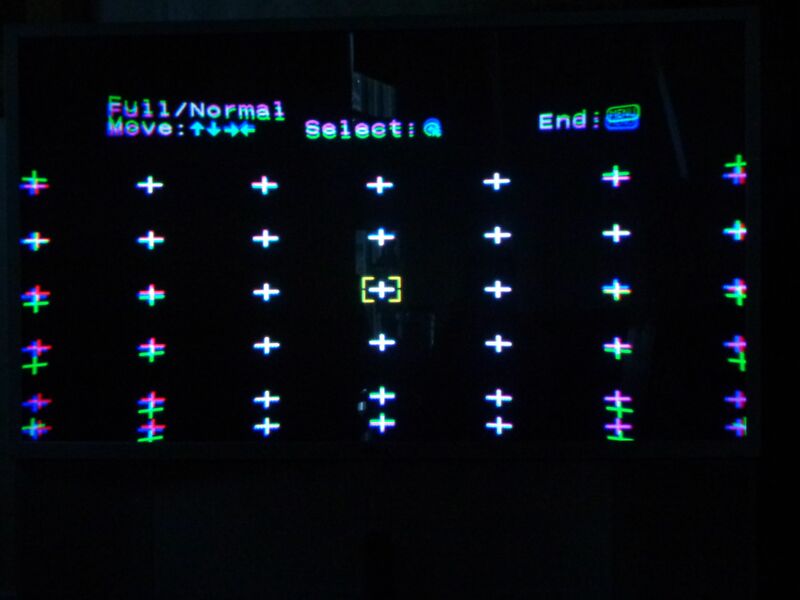 You had asked: "Are you able to move ALL 3 colors up & down & left & right ???" Only 2 of the colors move in all directions...north, south, east, and west. RED and BLUE move in ALL directions. Strange though, but I don't have an option to move the GREEN? Its almost as if its "fixed" The selection process goes from red to blue then back to default,.....default being the "movable" cursor. Is it possible that this may be the case? that green is supposed to be in a "fixed" position? Please forgive my ignorance but I'm not sure what it is that you want me to do when you say..."See page 39 in the service manual & do it with the CENTER CROSS ONLY..."
I looked on 39 and don't see a particular topic or section that starts there for me to follow. Here is what i see on page 39 and others. Perhaps if you can dumb it down a little bit or point me to a particular section(s) that you want me to follow that would make it easier. I' didn't attempt anything further because I'm unsure how to proceed and most importantly because ONLY 2 of the colors MOVE in all directions. Being that the GREEN wont allow adjustment or even selection does that suggest a possible faulty NEW IC? Green IS the reference that the red and blue are aligned to. Page number of pdf viewer matches the page number being shown? "Green IS the reference that the red and blue are aligned to." So it is "fixed" and can't be moved? Being that it is the reference? "Page number of pdf viewer matches the page number being shown?" I'm sure its my fault? I don't know? I've been trying to figure out what went wrong here !! !